WATCH OUT WHEN PHONING FROM YOUR HOTEL ROOM! AMERICAN BUSINESSMAN JOHN BURKE got a shock when he received his bill from the Palace Hotel - it included phone charges to the tune of �9.31. A 14 minute call to Germany cost �0.48 and a 26 minute call to a mobile phone in the UK came to 176.64. The hotel had also charged him �.75 for freephone calls. A hotel spokesperson said the hotel had later refunded the charges for the freephone numbers, and the problem had been sorted out amicably. 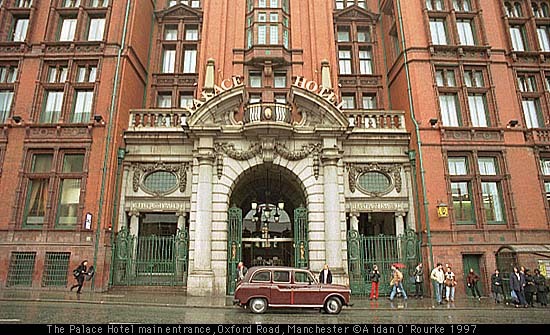 The Palace is the most expensive in Manchester for hotel room calls, charging 32p per unit, while the Campanile, in Salford, charges only 19p. Luckily, Mr Burke is rich enough not to mind paying the amount. My advice would be don't use the hotel room phone at all, hire a mobile instead, or use the payphone on the street! MANCHESTER SCHOOLS AND COLLEGES have achieved better A Level results than ever. Overall trends indicate that girls have outperformed boys. Parrs Wood High School, widely regarded as Manchester City Council's showcase school, achieved better results than ever, and at Manchester Grammar School, regarded as the city's best non-state sector boys school, 58 were offered places at Oxford or Cambridge. 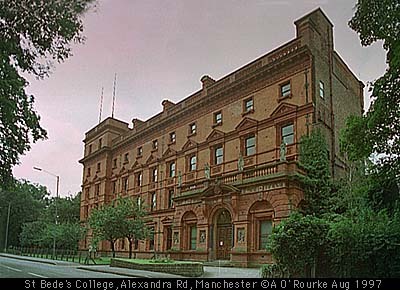 I remember going for my A Level results 22 years ago at St Bedes College (pictured above). Actually, I was a Xaverian boy, but had ventured into "enemy territory" during my final year to join Mr Chadderton's A Level German class. Despite my outsider status, I got a grade A. There is much controversy about exam results these days - some think that standards have fallen, but academics are certain that, whether Home Economics or Pure Maths, exams are just as difficult today as they've always been. 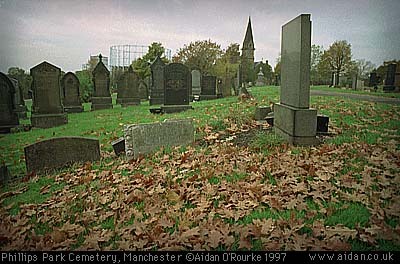 IN THE EARLY HOURS OF Sunday morning (yesterday) a couple were... taking advantage of the peace and seclusion of South Manchester's Southern Cemetery when in the middle of their "courting" session, a tombstone fell on them. She managed to struggle free, but he remained trapped under the tombstone. Firefighters from Moss Side fire station came and five of them lifted the stone free. The man was taken to Withington Hospital, where he was treated for head injuries. An Eyewitness in Manchester reader in Los Angeles drew my attention to this story, which also appeared in today's MEN, reported by Pam Marsden. Well, I'm sure there's a lesson for all of us here. The photo above is Phillips Park Cemetery, pictured last November. I don't remember seeing any courting couples when I took the photo. POLICE CONTINUE TO SUSPECT that a serial arsonist is responsible for recent fires at Wythenshawe Hospital, which have put vital operating theatres out of action for at least six months. Security at other local hospitals has been stepped up, and all entrances are locked up at night, apart from Accident and Emergency units. Recently, we got chatting to an off-duty security officer at a well-known local hospital. He had some interesting stories to tell. He reckons that bad behaviour among patients and visitors tends to peak around the full moon each month. He has often had to deal with lunatic behaviour, sometimes requiring the subject to be "sectioned". I don't remember any of that when at age six I was in Stepping Hill Hospital for an appendicitis operation. How times change. THE MARDI GRAS FESTIVAL gets underway in just four days. The event is primarily for the benefit of the lesbian, gay and bisexual community, though us "straights" are also welcome to come along. But this year, there will be an extra fund-raising element - in order to be served at the bars and clubs of the Gay Village, participants will have to purchase and wear a pink armband, costing at least � The money goes to Aids charities and you can donate more if you want to. Councillor Pat Karney has urged everyone to co-operate with the scheme, and given warnings to establishments in the Village who may choose to serve people who aren't wearing the armband. Some have criticised the scheme in strong terms, saying it will discourage heterosexuals from attending. Others say it's for a good cause, and should supported. Personally, I don't like the idea of an elastic armband - it's like being at the swimming baths, or in a maternity ward. A badge or sticker would, I think be better. IT'S BEEN RAIN SUNSHINE RAIN SUNSHINE over the past few days. Last Wednesday (pictured above) was sunny and summery. Yesterday brought bands of heavy rain sweeping across Manchester. Rain caused flooding at Sale Fire Station, as well as Withington and Christie Hospitals. Many house cellars were flooded. Overall, it was a dank, dull and drizzly day. But this morning, the sky was blue, and there was plenty of sunshine, though temperatures were cooler. Currently it's 59/13 degrees. THANKS TO A NEW APPLE MACINTOSH G3, shortly to be purchased, I'll be able to increase the number of photos that will appear on this page. I scan all photos from film - mainly colour negatives, but sometimes black and white negatives and colour positives. I will be able to work on the new computer, while the old computer and Nikon Coolscan do the scanning. Please let me know of any locations you'd like to see! Hello Aidan. What a great web site, thanks for keeping us Mancunians up to date with a great city and your photographs are superb. Have been reading you for quite sometime now but this is the first time I have been in touch. Was born in Newton Heath in the early '30s and as a teenager spent many a happy hour at Finnigans (in Cheetham Hill), in fact I met my wife there. I was told just recently that the 'Grand Old Lady' was burnt down a few months ago. If this is so, maybe you could run a few lines about it as I am sure this must have been reported in a local newspaper. My wife and I and our two daughters left Manchester in 1973 and settled in Scarborough (Toronto), Canada. We love it here but still have great sentimental feelings for our birthplace. Keep up the good work and keep those photographs rolling. (How about one of Shaw, near Oldham). By the way, we have had one of the hottest, sunniest summers for many years (just to make you a litle jealous) but still remember the Pak-a Mac, drizzly days over the pond. John (Jack) Siddall. I don't mind the rain too much, but I don't like too many grey skies. All in all, the weather here is far more bearable than in the Middle East. I wasn't aware of Finnigan's Cheetham Hill - I'll look into that one. Yes, there will be lots more photographs - more than before - appearing on this page, and going into the Image Collection. Keep visiting regularly! I read a most impressive obituary in The Age-one of our better daily newspapers here in Melbourne. It concerns the recent death of Sir Alan Walsh, the inventor of one of the most useful chemical analytical instruments, namely the atomic absorption spectrometer. He was born in a 'small village in Lancashire' and graduated in physics from Manchester University in 1938. He came to Melbourne in 1946 and joined C.S.I.R.O. and was knighted in 1977 on his retirement. I particularly liked his reply to the question- 'how he came up with the idea of doing atomic absorption spectroscopy', his reply was 'I managed to stop being stupid long enough to see something that should been obvious all along' - a great north country answer! Can you find out more about his early history? Hmmm, Sir Alan Walsh, I don't know him. I'll have a look in the Local History Library.